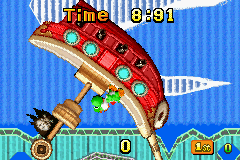 Yoshi's Pirate Battle is a minigame that appears in Yoshi Topsy-Turvy. The minigame takes place on a Shy Guy Ship and gives the player a thirty second time limit. The player must tilt their Game Boy Advance system to make the Shy Guy Ship swing and try to make the ship swing in a full rotation as many times as possible before the time limit runs out. The player can keep trying for a better score. It can be unlocked by completing the Eggling Book. This page was last edited on February 7, 2018, at 02:35.